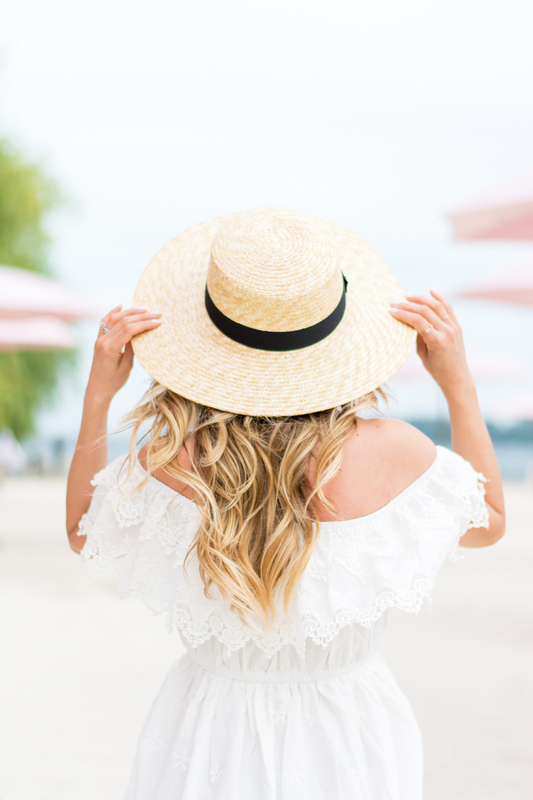 OOTD - Lace Off The Shoulder | La Petite Noob | A Toronto-Based Fashion and Lifestyle Blog. Like most people, when I think summer my mind immediately wanders to the beach. Sugar Beach is a white-sand, pink-umbrellaed oasis in the middle of downtown Toronto and is a great place to put your feet up in the big city. This white lace off-the-shoulder dress from Chicwish is a great summer day-to-night option for those hot and muggy days. Paired with some wooden platforms and a boater hat, this outfit can take you from beach to town in no time. You guys know that I'm no stranger to the retro trend that's been around all year, so when I saw these wooden clog-type shoes from Le Chateau my first thought was: come to mama. I love how the platform adds some interest, and makes them extremely comfortable to walk in. After years (yes, years) of searching, I was finally able to find the perfect boater hat at Dynamite. The brim is larger than a traditional boater hat, but it makes the look more feminine and is a great summer accessory. What do you guys think? Are you into the off the shoulder trend as much as I am this summer? What's a good day-to-night summer outfit for you? Let me know! These pictures are stunning! You look amazing. Love the hat, too. Love this dress on you, Joëlle. Stunning. And I'm still 100% down with the off-the-shoulder trend - I just bought a top from Forever21 similar to the top of your dress, and a black Bardot style bodysuit from ASOS that will hopefully take me right through to the winter! OHH sounds awesome! A bardot style bodysuit sounds amazing, and definitely a great layering piece into winter! Um I love!! You may Sugar Beach seem even more glamorous than it actually is. HAHA so true right! It's pretty - if you just look straight ahead LOL! Such a perfect beach outfit! And you are rocking that hat girl!